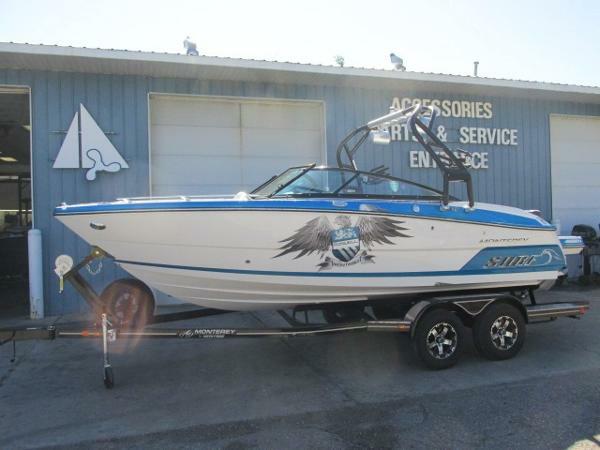 2017 Monterey 218 Super Sport Stock#8034 This in stock 2017 Monterey 218 Super Sport has just arrived and she is awesome. Powered by a Mercruiser 4.5L. Cat. Alpha 250hp. When you hear the term Super Sport, you are immediately brought back to the days of the American Muscle car. Camaros, Chevelles, GTOs. Fast, Flashy, and the latest features. The Monterey Super Sports powerboats relive that era.on the water. With the sensational success of Monterey's largest Super Sport, the 328, they gathered the best attributes of that beauty, and designed an entire line of boats. At 21 feet in length, she may be the smallest of the Super Sports, but dont let her size deceive you. This is one mean machine! She is well equipped and an optional BoatMate Custom Trailer w/brakes on both axles and custom wheels is also available for $4,195. 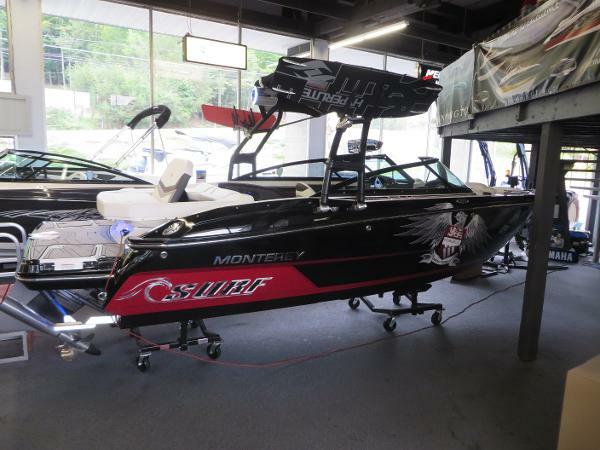 2017 Monterey 218 Super Sport DEMO BOAT! DRASTICALLY REDUCED PRICES! BRAND NEW WARRANTIES. 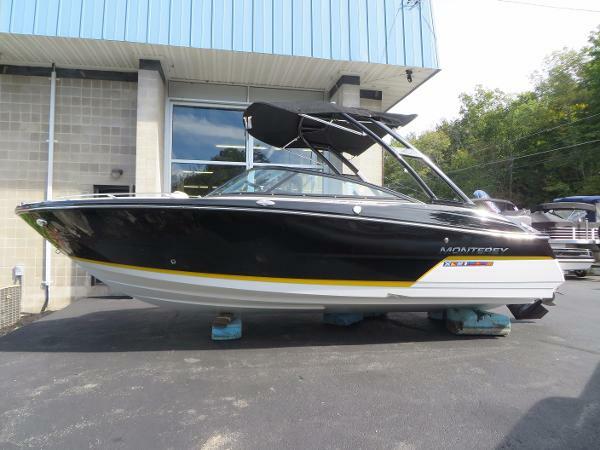 About 20 hours on it, has a couple nicks and scratches, huge savings 2017 Monterey 218 SS Bowrider - Surf Edition - powered with a Volvo V8 300HP FORWARD DRIVE I/O! The forward drive system is revolutionary and gives you the wake benefits of a true inboard with the performance and maneuverability of an I/O! Massive surf wake. Most of these boats are selling for over $75,000. 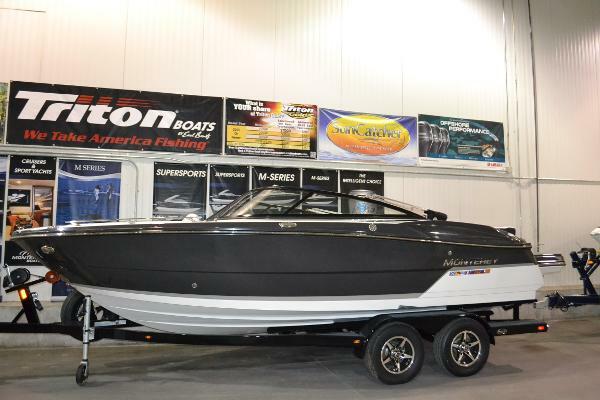 This boat has huge discounts because it is a rep demo. Price does not include trailer - custom trailer $4,999 Options on this boat include: Volvo-Penta Forward Drive Outboard Surf Package - Black Tower Stainless Steel Upgrade Package Roswell Swim Platform Inlay - Grey Roswell Cockpit Inlay - Grey Underwater LED Lighting System Bow & Cockpit Cover Cockpit Table Depth Sounder Stereo Remote - Helm & Stern Transom Tilt Switch Bow Filler Cushions Portside Forward / Aft Adjustable Lounger Onboard Battery Charger This price includes a trailer! Stop by the marina or call us if you have any questions or would like to see the boat! With the sensational success of our largest Super Sport, the 328, we gathered the best attributes of that beauty, and designed an entire line of boats. At 21 feet in length, she may be the smallest of the Super Sports, but dont let her size deceive you. This is one mean machine. 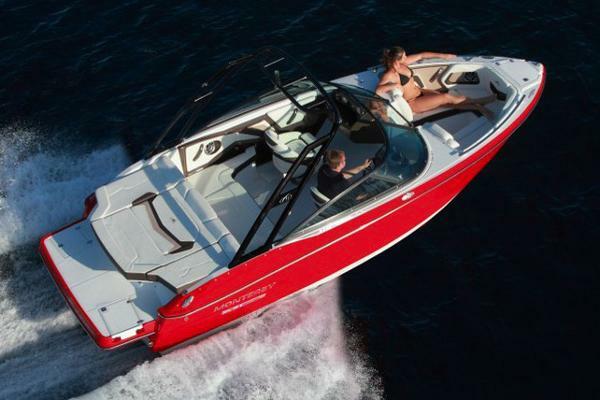 2017 Monterey 218 Super Sport Powerboats - 218SS Super Sport When you hear the term Super Sport, you are immediately brought back to the days of the American Muscle car. Camaros, Chevelles, GTOs. Fast, Flashy, and the latest features. The Monterey Super Sports powerboats relive that era.on the water. With the sensational success of our largest Super Sport, the 328, we gathered the best attributes of that beauty, and designed an entire line of boats. At 21 feet in length, she may be the smallest of the Super Sports, but dont let her size deceive you. This is one mean machine! 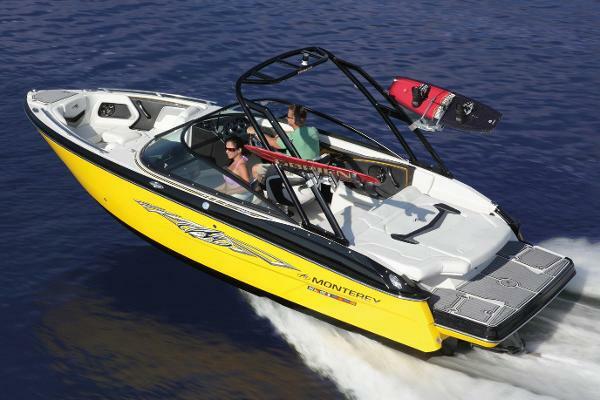 2016 Monterey 218 Super Sport With the sensational success of our largest Super Sport , the 328, we gathered the best attributes of that beauty, and designed an entire line of bowrider boats. At 21 feet in length, she may be the smallest of the runabout Super Sports, but don’t let her size deceive you. This is one mean machine.